As spring approaches and temperatures increase, it’s worth remembering that any bacteria in our ponds become more active much quicker than our Koi’s immune systems can respond. With this in mind, here’s a reminder of an experience I had a few years ago that might just help to convince you that it is well worth giving our systems a good clean at this time of year. Fed up with the high maintenance requirements of other filter media I’d tried, I decided to convert the first chamber of my multi-bay filter to use fluidised K1 media. Removing the original matting and filling the chamber with K1 was easy, but containing the K1 to prevent it escaping when the chamber was flushed or finding its way into the second chamber, or worse still the pump impellor, was much more challenging. Finally, (or so I thought) was the simple task of installing the air supply needed to fluidise the media. 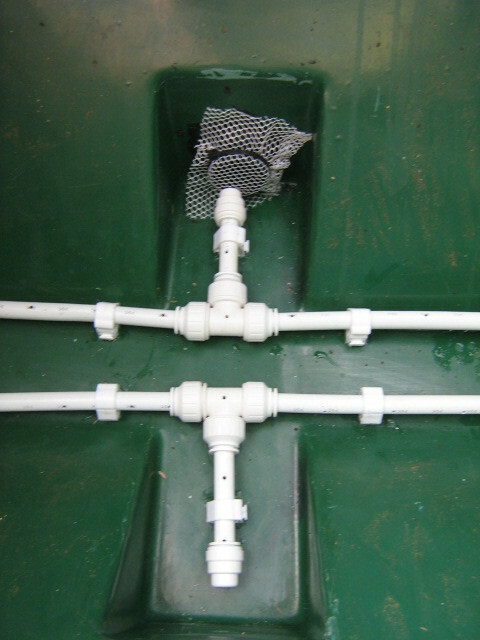 To prevent the K1 being lost when the chamber was flushed I installed a perforated plastic sheet (supported on normal plastic media grids to give it strength). 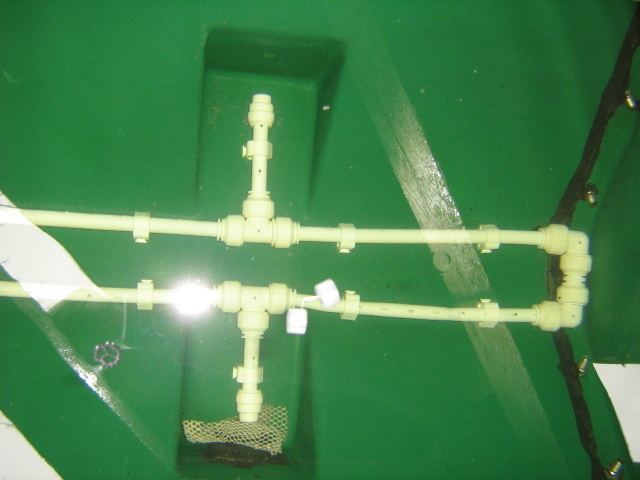 I used a similar perforated sheet to prevent the K1 flowing over the wier and into the second chamber (and subsequently the pump). However, because of the limited depth of water above chamber divider that creates the weir, the holes were too small to allow sufficient flow and the pump just emptied the second chamber! Undeterred, I replaced this with food grade stainless steel mesh to increase the water flow over the weir. Success! My pride was intact, but my wallet had suffered a severe blow. Food grade stainless steel costs a small fortune - luckily I didn’t need too much of it. The air supply proved to be much easier than expected. I made a simple “loop” of airline using speedfit pipe and fittings, drilled some 2mm holes along the length of it and just connected it to an air pump using some garden hose. This was fixed to the perforated plastic sheet under the K1 using plastic cable ties. This photo shows the perforated sheet and airline in position before the K1 was added. Apart from a slight hiccup when the air lifted the plastic sheeting (easily weighted down with a couple of small sized rockery stones) I now had a filter chamber that utilised a much acclaimed, state-of-the-art filter media and was working well – or was it? Well, winter came and went with no real problems. Spring arrived and the koi began to wake up slowly – but the long awaited summer never really materialised did it? All last summer my water temperature never got higher than 18oC and my koi never looked 100% and didn’t eat as readily as I like them to. I put this down to the low water temperatures not really kick starting my koi’s immune systems and a persistent problem with Nitrite in my pond (nothing too serious, but never down to zero) again caused by the low water temperatures preventing sufficient bacteria in my filters. I just kept to my usual filter maintenance regime of regular flushing and water changes and looked forward to this summer. As well as watching my koi, I also believe you should practice what you preach. As recommended in the January newsletter, I gave my filters a good spring clean (although I didn’t get round to it until March). Do you know how enfuriating it is to try to remove 80-90 litres of K1 from a filter chamber and place it in a bowl that will only comfortably hold 60-70 litres before it overflows – especially when it’s blowing a gale? I admit to being tempted to give up the idea of a spring clean, go back inside, make a cup of tea and watch some day time telly (it was only the day time telly that made me stick to the spring clean). As I lifted the perforated plastic sheet, it slipped. One of the rockery stones slid off the edge of it and I had to jump back quickly – the stench was unbearable! Holding my breath to avoid the smell of rotten eggs, I looked back into the chamber. There, hidden under the perforated grid, was the cause of all my problems. Despite regularly flushing my filters all through the winter, there was a massive build up of detritus in the base of the chamber. I’d been religiously practising what I thought was good pond husbandry. Unfortunately, the 30 second flushing of the chamber was not very effective, so even if I’d done it every day! The build up had become anaerobic and was releasing Hydrogen Sulphide gas into the water. Hydrogen Sulphide (also known as Sewer Gas) is highly toxic and, in an enclosed space such as a sewer pipe, can kill a man in just a few minutes – and my koi had been swimming in it for who knows how long. Unfortunately, I didn’t have a camera handy at the time and cleaning the chamber properly was my priority, so there are no photos of the really dirty chamber. Suffice to say, I cleaned it thoroughly (including vacuuming the chamber) and there was no sign of dirt anywhere. At least I now had a good idea what the problem was and could think about how to solve it. I reassembled the chamber as it was and started thinking about a solution. I discussed the problem and my set up with Mark at Cuttlebrook Koi Farm and he suggested removing the perforated sheet and moving the airline right to the bottom of the chamber. The theory is that the moving K1 will keep any dirt suspended in the water and keep it moving through the biological stage of the filter. If the theory works, there’s an added bonus of not needing to flush the chamber in future (no point if nothing settles to be flushed away! Four rainy days and 10 minutes of day time telly later I was bored enough to do battle with the K1 again. I started by flushing the chamber for 30 seconds again (the second time since the spring clean), removed the K1 and lifted the perforated sheet. This photo shows the detritus build up in just four days – imagine what was there after a whole winter! 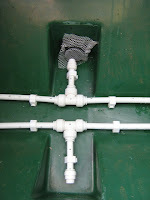 You can also see the drain for the filter at the bottom of the photo. Some more speedfit pipes, fittings,cable clips and sealant were all that was needed to sort the air supply. But if I did need to flush, or hopefully only drain the chamber on rare occasions, I needed to stop the K1 entering the drain. Well, I never thought I’d consider taking bthe washing out of the washing machine as being in the right place at the right time, but it was! There in the drum of the machine, along with all the washing, was a little net bag. Apparently it’s for putting the soap tablet in before you start the washing machine??? But I had a much better use for it. All that remained was to put the K1 back in, top up the pond and filter and test the theory! A month went by and my koi were still very happy and getting more active. This was a good sign, but I wanted to be there was no more detritus building up where it couldn’t be seen - under the K1. Was the improved koi activity still due to the original spring clean, or was the modification really working? The only way to be sure was………………………………..yep, do battle with the K1 yet again! 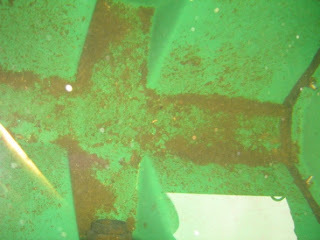 I did no maintenance whatsoever of this filter chamber for the whole month and didn’t flush it before removing the K1. I’d also reduced my weekly water changes to between 5% and 10% each week – so you environmentalists can smile again! These photos are of the same chamber and are taken from almost the same angle, just over a month apart. The water is still in the chamber in both photos (odd bits of K1 can be seen floating in the second photo). ﻿﻿﻿ Does the theory work? Did my water quality improve? Were my koi healthier, more active and eating more? Have I stuck to the same principle with the filters for my new pond? HAVE YOU DONE YOUR SPRING CLEAN YET?